Editor’s note: In recognition of the industry ideals reflected in the PRSA 2014 International Conference theme “Leading the Way: Fearless Future for PR,” we’ve invited industry-leading female CEOs to share their inspiration, tips and advice on how to grow, succeed and advance to the highest levels in the profession. 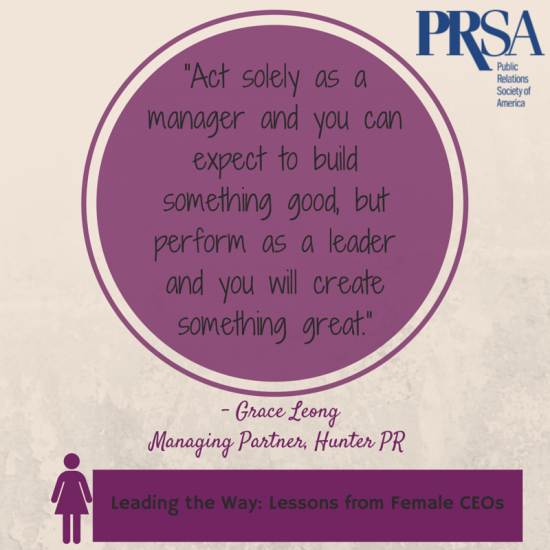 Follow the “Leading the Way: Lessons from Female CEOs” series using the hashtag #PRLessonsInLeadership. It’s almost impossible to graduate from business school without hearing the name Peter Drucker. Often referred to as the “founder of modern management,” Peter Drucker has contributed to almost every aspect of business, including corporate structure, marketing and human resources. However it was Drucker’s perspective on the distinction between management and leadership that helped me evolve my perspective on what it takes to build and grow a thriving public relations agency. Drucker said “Management is doing things right, but leadership is doing the right thing.” Management and leadership are complementary and should always be, but the magic lies in how they differ. Management is the process of organizing, scheduling and optimizing the work to gain efficiency, but leadership is the art of nurturing skills, developing talent and inspiring results. Today’s companies succeed when managers go beyond managing the work, and evolve into leaders who nurture, provoke, exalt and inspire great talent. Act solely as a manager and you can expect to build something good, but perform as a leader and you will create something great. Most successful PR firms are started by smart practitioners who have great experience, a strong passion for the business and the industry and are probably really good at delegating and getting the work done – hence good managers. But because these managers are good at what they do, the business grows and in no time, they have a solid business with great potential for growth. This is the point in the agency life-cycle when it’s crucial to understand the difference between management and leadership, because it’s no longer good enough for PR agency entrepreneurs with a growing business to continue to act like managers. Inspiring others to help deliver the results and grow the business becomes your job. In short, it becomes time to evolve from a manager that leads the work and nurtures the business to a manager who leads people and nurtures their growth. In building our agency, remembering Drucker’s theory on management and leadership helped my partners and I at Hunter PR evolve our management approach into a leadership approach. By both investing in talent within the agency and hiring entrepreneurial-minded practitioners who had specialized expertise, which went beyond our own, we saw great growth in our firm, and more importantly in our people. Leaders never say “I”: Leaders always think “we” And, not because they have trained themselves to never say I, but because they really think this way. They understand their job is to make team better. As a result of this approach they build trust and their businesses prosper. Leaders are never afraid of success for others: Successful leaders are in the business of making sure others succeed. They don’t try to be the smartest person in the room or pretend to have all the answers. They surround themselves and nurture talent stronger than themselves. Leaders act and communicate with focus: The best leaders are those that focus on a few things and do them really well. These same leaders also communicate well so that others know what they are trying to accomplish. There is great pressure on leaders to get a lot of things done, but the best leaders inspire their teams by staying sticking to a clearly defined and communicated mission. In the PR business, we are fortunate to be working in an industry brimming with entrepreneurial talent, enthusiasm and smarts. As agency leaders dedicated to our client’s success, we owe it to the hard-working practitioners who have chosen an agency career to be the type of leaders who Drucker describes above and go beyond assigning task and managing work efficiencies. We need to chart the course, define the purpose, inspire innovation, put people at ease, identify and provide resources and make connections. My hope is that as PR agency leaders we can continue to provide the leadership that our dynamic workforce deserves so we can all grow and prosper together. Grace Leong, APR, MBA is Partner and CEO of Hunter Public Relations, named the 2014 “Consumer PR Agency of the Year” by the Holmes Report. A 25-year agency veteran, Grace recently founded Legend PR, a communications firm run by entrepreneurially-minded practitioners who design and implement media agnostic communications programs for new and mature brands.